HUGE thanks to Jen at Crazy for Books for always sponsoring this GREAT hop! But, for the next few months, this Book Blogger Hop will be traveling around being hosted by other blogs. This week you will find it at Soon Remembered Tales so please visit her blog and you'll find all the other blogs that are participating! Back at Jen's blog, you'll see the schedule for then rest of the year to January! This week's Question: With Autumn upon us and Halloween drawing near, what books remind you of fall? What ones do you enjoy reading that are about autumn? I do like to read books that have to do with the year's season. Not that I always do, but it's nice, especially around Christmas time. I don't necessarily 'look' for books that are associated with the season, but bookstores be it brick and mortar, online or catalogs I receive in the mail always have a way of suggesting great books that go with the season. Since this is Fall, I don't associate it with Halloween as I'm not a huge fan of it. I think if you have younger children it's more fun, but mine are grown now. I think of the beautiful colors of Fall. 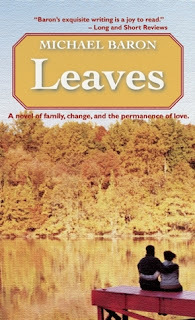 This year I happened to be on NetGalley and found a book called "Leaves" by Michael Baron! He is one of my FAVORITE AUTHORS! So I requested it, got it, and will be starting it within a few days! Here is the cover and the link to Amazon, then a nicer and larger cover! Welcome to Oldham, CT, a small town rich in Colonial heritage while being utterly contemporary. Situated along the Connecticut River Valley, Oldham bursts with color every fall, as the leaves on its trees evolve into an unmatched palette of scarlet, orange, purple, yellow, and bronze. For more than three decades, the Gold family has been a central part of Oldham in the fall, its Sugar Maple Inn a destination for leaf-peepers” from all over the country, and its annual Halloween party a stirring way to punctuate the town’s most active month. But this year, more than just the leaves are changing. With the death of their parents, the Gold siblings, Maria, Maxwell, Deborah, Corrina, and Tyler, have decided to sell the Sugar Maple Inn, and this year’s Halloween party will be the last. As October begins, the Golds contend with the finality that faces them, and the implications it has for a family that has always been so close. For some, it means embracing new challenges and new love. For others, it means taking on unimagined roles. And for others, it means considering the inconceivable. Complicating it all is a series of hauntings” that touch each of the Gold siblings, a series of benign interventions that will remain a mystery until October draws to a close. Filled with romance, tension, and unforgettable family drama, Leaves is the first in a series of novels about a world and a family that readers will want to make their own. Sounds GREAT, huh! Make sure to click on the LINK up above under the photo to go to the sponsoring site to see ALL the blogs that are participating! I usually don't read books just because of the season. I have seen this book around. I hope it is good. Thanks SO much for stopping by AND for leaving a comment, too! I was just at your blog the other day reading a post, too! I can't remember if I left a comment or not? I think this book will be GREAT! Michael Baron is AWESOME! They compare his writing to Nicholas Sparks. You know I have to be honest and say I have NOT read Nicholas Sparks yet! Michael Baron usually has a little paranormal in his books, but ever so slightly. For instance in Anything, a man and his fiance' shop in this little off the beaten path store they love. One day he stops in there by himself, and he tells the shop owner he wishes he could know EVERYTHING about his fiance', starting from the time she was born, to when she started walking, to when she started Kindergarten, up to the time they met. The shop owner says he thinks he might be able to arrange it, but he would not be able to talk or do anything, just see. Hmmmm! My full review is at http://bit.ly/Rn302V It's an awesome book! I WILL come back by your blog and check out what you answered! I'll have to see what I was there for, too! I'll leave a comment for sure! Thanks again for coming by! Also thanks for leaving a comment, too! LOVE it when people do! That's so cool to stumble on a new book by a favorite author. And I definitely agree that Christmas books during the Christmas season are great--those are usually the only seasonal books I seek out. Thanks for coming by my blog, Cheryl! Yes, it was SUPER GREAT to find it! That is THE BEST when that happens! I was GEEKED!!! If you have not read any of his books, I would HIGHLY recommend reading "Anything" by Michael Baron! It's a romance/love story with a little bit of paranormal in it, in which a couple are getting married and the man wants to know EVERYTHING about his fiance'. They have this favorite story they LOVE to shop in, and he went in there one day on his own without his fiance'. He and the owner get to talking, and the man tells the clerk he wishes he had the chance to know his fiance' from the time she was born, first walked, went to Kindergarten and everything else after that up until they met. The store owner says he thinks he could arrange that. He would not be able to do anything but see it, but if he would like to try it, they could. They do . . . OH MY!!! Wow! Here's the link to my reveiw! http://bit.ly/Rn302V WELL WORTH the read! Hope to see you again! I'll stop by your place and check it out, too!